On December 14, the National Labor Relations Board (NLRB) overturned a 2015 policy that had made it easier for workers—particularly fast-food workers—to unionize and challenge their employers over unfair labor practices. The Obama-era standard sprung from a 2013 case involving workers attempting to unionize at a recycling plant in Milpitas, Calif. The recycling company, Browning-Ferris Industries, owned the building but used a small staffing agency called Leadpoint to provide and manage workers. The local Teamsters union was trying to organize the employees, but it didn’t want to merely negotiate with Leadpoint: It wanted Browning-Ferris to be considered a joint employer and party to any labor contract. A regional director determined that Leadpoint was the sole employer, but the Teamsters requested a review, and the NLRB’s general counsel sided with union in a 3-2 vote. The vote was hailed by unions and labor advocates for making it more difficult for corporations to distance themselves from certain legal violations—and for strengthening the bargaining power of subcontracted gig-economy workers. The Browning-Ferris decision was also good news for fast-food workers and organizations like Fight for $15. 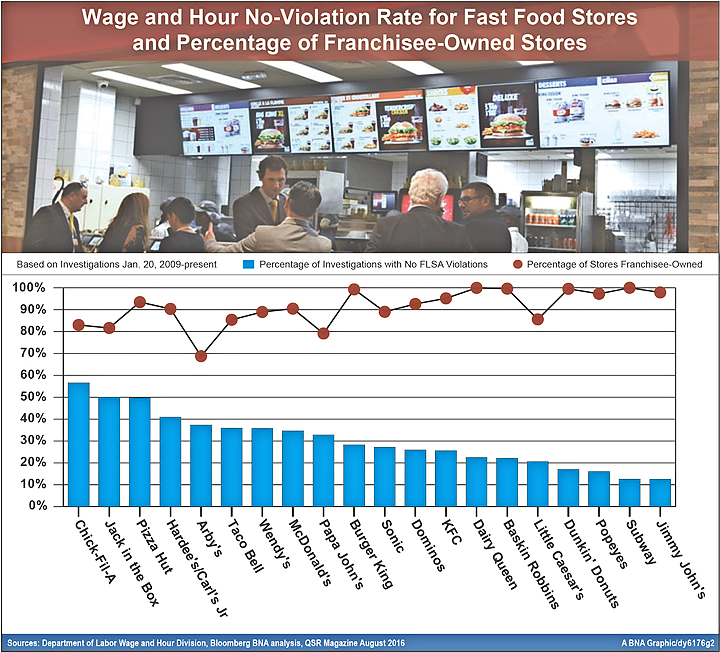 Most fast-food companies use a franchising model, and Browning-Ferris made it easier for workers to hold corporations responsible for wage theft and union busting at individual locations. In 2014, the NLRB’s general counsel had already ruled that the McDonald’s Corporation could be considered a joint employer in various labor cases brought against the company’s franchises. But Browning-Ferris provided an entirely new legal dimension to the proceedings. The Browning-Ferris decision was predictably criticized by industry groups, which immediately launched an all-out assault on the new rule. International Franchise Association lobbyist Matt Haller declared that the decision was “a knife-to-the throat issue,” pro-business organizations pressured Congress to block its implementation in their subsequent spending bill, and Browning-Ferris Industries challenged the decision in a federal appeals court. While there is no evidence that Trump was directly involved in the case, we do know that one his companies was impacted by the 2015 decision. In May 2016, catering workers at the Trump National Doral golf resort in Florida won a $125,000 settlement after suing for unpaid wages. As a result of the joint-employer liability, the workers were able to hold Trump Miami Resort Management responsible, even though an outside staffing agency had hired them. It is likely that the Trump administration will soon work to overturn a number of additional Obama-era NLRB decisions. To the surprise of many, the board ended up adapting to the complexities of a changing economy under Obama and forcefully asserted the rights of workers in a number of important votes. Recent NLRB decisions have given graduate students the right to unionize at private universities, increased the bargaining power of workers at charter schools and made it easier for smaller groups of workers to unionize at companies. However, the term of the NLRB’s Republican chairman, Philip A. Miscimarra, ended just days after the board’s vote. Trump will at least have to wait until the Senate confirms his next nominee and reestablishes the Republican majority before he’s able to undo any of these changes. This article was originally published at In These Times on December 21, 2017. Reprinted with permission. In an otherwise grim period for the U.S. labor movement, the fast food industry has been a hot spot for organizing activity. For the past four years, the union-backed Fight for 15 movement and allied groups have staged a series of nationwide, day-long strikes and protests in support of higher wages and unionization for fast food workers. Fast food workers have yet to gain any significant union representation. But thanks in large part to the movement’s efforts, states and cities across the country have passed minimum wage laws raising pay for millions of people. And now, if President-elect Donald Trump has his way, an enemy of the Fight for $15 movement will lead the U.S. Labor Department. 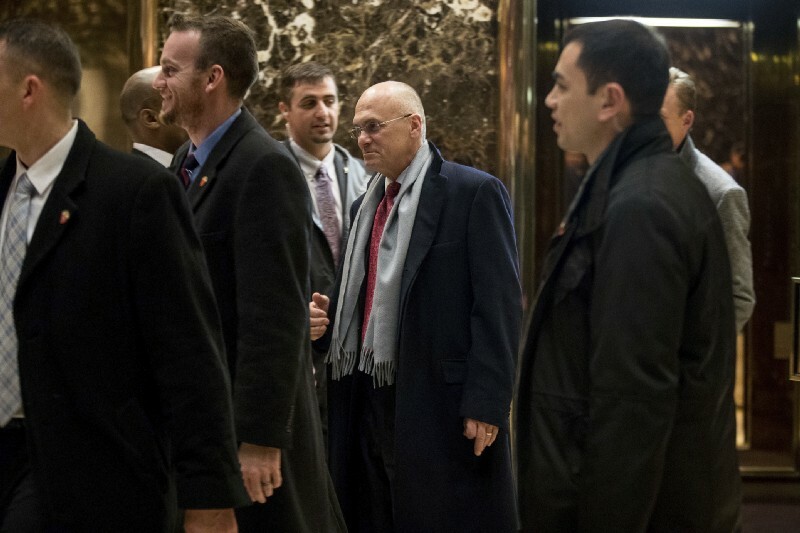 On Thursday, Trump revealed that he had nominated Andrew Puzder, CEO of CKE Restaurants, to be Labor Secretary. CKE Restaurants is the parent company of Hardee’s and Carl’s Jr., two fast food companies that have been targeted by Fight for 15. Puzder himself is on record as an opponent of raising the minimum wage, and has said that he would like to try automating service more service jobs in response to wage hikes. Unsurprisingly, the fast food lobby was delighted with Trump’s decision to elevate Puzder. International Franchise Association President and CEO Robert Cresanti called Puzder “an exceptional choice to lead the Labor Department” in a statement responding to the news. Cresanti also offered up a wishlist for Puzder’s early days in office. The Obama Labor Department issue a rule (currently held up in federal court) that would dramatically expand the number of workers eligible for overtime pay. The department has also fought to expand joint-employer liability, meaning that multinational corporations such as McDonald’s may be held legally accountable for labor law violations committed at their franchised locations. “We are hopeful that, if confirmed by the Senate, a top priority [for Puzder] will be rolling back the damaging effects caused by the expansion of joint employer liability to America’s 733,000 franchise businesses, and the too-far, too-fast increase in the overtime threshold that was recently put on hold by a Texas judge,” said Cresanti. As Labor Secretary, Puzder would head up the main government agency charged with investigating claims of wage theft. A 2016 Bloomberg analysis of Labor Department data found that Hardee’s and Carl’s Jr. restaurants were themselves frequent violators of the law. This blog originally appeared in ThinkProgress.org on December 8, 2016. Reprinted with permission. 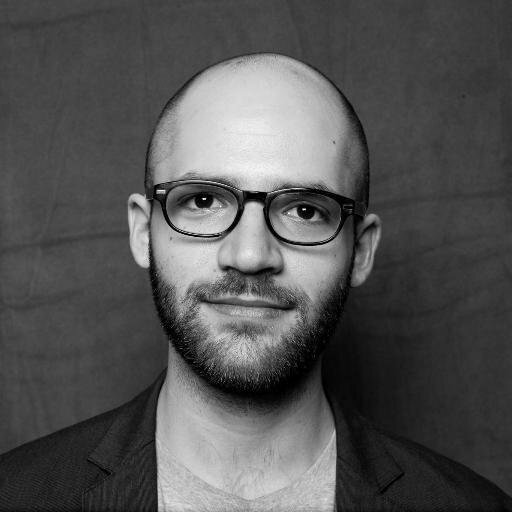 Ned Resnikoff is a senior editor at @thinkprogress.He was previously a reporter for for International Business Times, Al Jazeera America, and msnbc. Follow him on twitter @resnikoff. 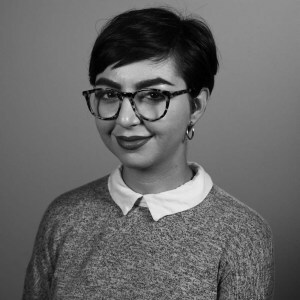 Last year, at age 17, Eli Fishel moved out of her parents’ house in Vancouver, Washington, squeezing into a three-bedroom apartment with five other roommates. To pay her bills as she finished high school, Fishel landed a job at Burgerville, a fast-food chain with 42 outlets and more than 1,500 employees in the Pacific Northwest. After 16 months on the job, she earns just $9.85 an hour, barely above the Washington State minimum wage. Her hours and shifts fluctuate weekly, with only a few days’ notice, and every month she goes hungry because she runs out of money to buy food. Disgruntled Burgerville workers began covertly organizing in 2015. 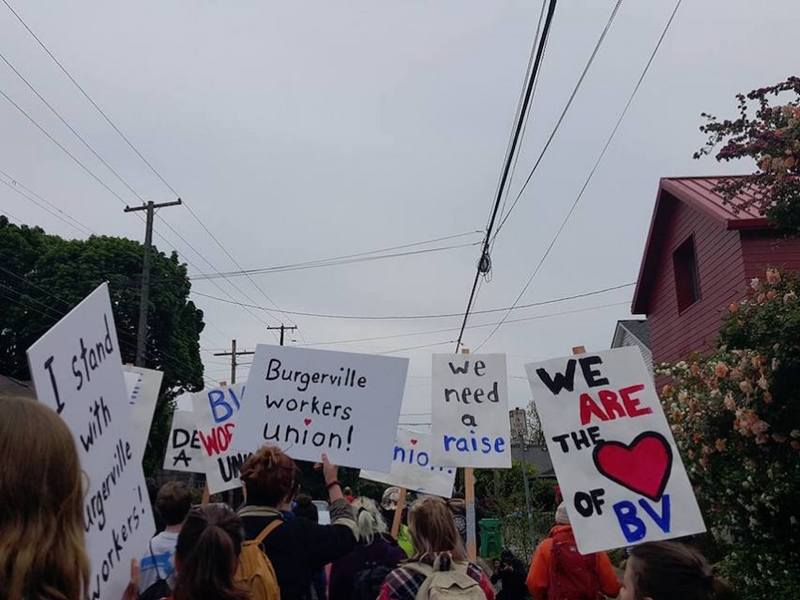 The Burgerville Workers Union (BVWU) went public on April 26 with a march of more than 100 people through Portland, Oregon, and the delivery of a letter to the corporate headquarters in Vancouver. BVWU demands include a $5-an-hour raise for all hourly workers, recognition of a workers organization, affordable, quality healthcare, a safe and healthy workplace, and fair and consistent scheduling with ample notice. Some BVWU members call their effort “Fight for $15, 2.0,” playing off the name of the fast-food worker campaign launched in 2011 by the Service Employees International Union (SEIU). SEIU has won plaudits for making the plight of low-wage workers a national issue and igniting the movement for new laws boosting the minimum wage to $15 an hour. But the campaign has not, thus far, included efforts to unionize individual workplaces. Unlike Fight for $15, which Middlebury College sociology professor and labor expert Jamie McCallum describes as “a fairly top-down campaign,” BVWU is a worker-initiated and -led project backed by numerous labor organizations. The group of Burgerville workers who came up with the idea includes members of Industrial Workers of the World (IWW), a militant union with West Coast roots that date back to the early 1900s. The campaign has the backing of the Portland chapter of IWW and the support SEIU Local 49, the Portland Association of Teachers, and Jobs with Justice. This scrappy approach enabled BVWU to leapfrog Fight for $15 by declaring a union from the start. While BVWU has not yet formally petitioned for recognition and Burgerville has not chosen to voluntarily negotiate with it, the union has established worker committees in five stores, is developing units in a similar number of shops and counts scores of workers as members. BVWU is full of lessons in how organizing works. One member likens the campaign to “low-level guerrilla warfare” with workers maneuvering to increase their ranks, build power on the shop floor, expand the terrain from shop to shop, while skirmishing with managers over the work process, and suffering casualties as some members have quit or say they were pushed out of their jobs at Burgerville. In the workplace, the strategy is to develop leaders, form committees for each store, and nurture trust and respect between workers. Outside, BVWU uses direct action to empower workers and bring suppliers into the conversation. The union also works to build community support by mobilizing social-justice groups, clergy, and organized labor to win over the public and pressure the company. “It doesn’t require a mass base. It requires mobilized workers with incredibly talented organizers to move sympathetic politicians in a defined geographic area,” McCallum says. If SEIU can prove that McDonald’s calls the shots in its franchises, it could also push open the door to unionizing the whole company at once instead of the Sisyphean task of one franchise at a time. Deploying organizers, researchers and lawyers, SEIU has gathered evidence for 181 cases alleging that McDonald’s controls its franchisees’ employment practices and therefore should be held accountable for unfair labor practices in franchisees, including retaliation against workers who supported unionization. In 2014, the NLRB issued a preliminary finding in favor of SEIU’s case and, then the next year in a separate case involving Browning Ferris Industries of California the labor board revised the definition of joint employer to “consider whether an employer has exercised control over terms and conditions of employment through an intermediary.” Years later, the McDonald’s case is still grinding its way through a judicial process, with a multi-city case being argued before an administrative law judge that was kicked back to the NLRB on October 12. If the board finds or any of the court cases, which includes multiple class-action suits SEIU has backed against McDonald’s for wage theft, determine that McDonald’s is a joint employer with its franchisees, that may finally open the door to a company-wide union drive. The Burgerville campaign’s strategy of painstakingly organizing shop by shop emphasizes “building worker power,” which is both “a means and a goal,” says Flanagan. For BVWU, the initial organizing drive was relatively easy, with workers chafing at difficult working conditions and poverty-level wages. Debby Olson, 49, a military veteran, has worked at Burgerville since her home-cleaning business tanked during the Great Recession. She says the “people are nice, but the pay is horrible.” After six years, she makes $10.75 an hour. The Burgerville campaign builds on the IWW’s experience over the last decade in fast-food organizing at Jimmy John’s and Starbucks. Picking a regional chain works to the benefit of the union as it can exert more pressure because Burgerville doesn’t have the might of a global food giant and its carefully crafted image is ripe for attack. The public may eat up buzzwords like local, fresh and sustainable, but Burgerville’s rhetoric sticks in workers’ throats. Fishel says that despite a 70 percent discount for food on shift, she still sometimes can’t afford it. “If your workers are going without food, how can you say you are a better, more sustainable option for your community?” she asks. But BVWU members keep the heat on whether by wearing a union button on the job or tussling over floor mats. Members are demanding mats to ease the stress of standing for hours. Management relented in a few stores, but the mats have emerged as a proxy war. Flanagan says despite having mats, managers will put them away and she will bring them back out. BVWU’s strategy is known as “minority unionism” because BVWU may not have a majority in each shop willing to declare support for a union. This sort of organizing circumvents a federal labor-law process that makes union elections difficult, time-consuming and expensive. But BVWU utilizes the NLRB process when it is to its advantage, such as by filing unfair labor practice charges that allege Burgerville is illegally retaliating against the union and workers. Burgerville worker Brennan says BVWU relies on the IWW model: “It teaches, ‘You’re a worker who hates your job, here’s how to build a committee.’ ” Each organized store began with a committee and grew from there. BVWU claims Fleak was later forced to quit under pressure after the company allegedly threatened to file spurious criminal charges against her for gift-card theft. Burgerville declined to comment on her case, saying,“Burgerville is dedicated to continuously enhancing our relationship with our employees. We do not comment on individual employee matters or internal communications.” The company also opted not to comment on the BVWU campaign or on complaints about wages and working conditions. In the case of another BVWU supporter fired over a workplace accident, the union organized a delegation of 50 people to the corporate headquarters asking for the worker’s job back and conducted a food drive for the worker. It publicized the firing to make the case that Burgerville pushes workers“past their limits” and demanded a transparent disciplinary process. More than half the workers in that outlet also signed a petition asking for the worker to be rehired. The worker remains fired. Flanagan claims when Burgerville says it has to “maintain the status quo,” what it’s really saying to workers is, “If you didn’t get a raise, blame the union.” On August 15, Burgerville Workers Union filed four charges of unfair labor practices with the NLRB, including one concerning the anti-union video. Labor law is fuzzy on the issue. 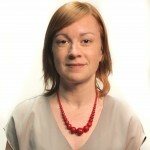 Companies are prohibited from increasing benefits during a traditional union election campaign, but as a minority union, BVWU is acting outside of this framework as a minority union. BVWU has also taken the offensive by hitting at the company’s public image. The worker-organizers have kept up a brisk pace for five months, averaging an action a week such as vigils, marches, pickets and a bicycle ride. When BVWU members visited Liepold Farms near Portland, which supplies Burgerville with berries for its signature shakes, to ask for support, the farm owner was taken aback but accepted their letter. Shortly after BVWU was unveiled, dozens of workers, local labor leaders, activists, and clergy packed the corporate headquarters in support. Time may be on the side of BVWU. The more shops the union can organize, the more workers who join, and the more community support it builds, the likelier it is BVWU will force Burgerville to the bargaining table, with or without a majority union. Then the Burgerville Workers Union may be the one opening new outlets. To find out more about the Burgerville Workers Union, go to burgervilleworkersunion.org. This blog originally appeared at InTheseTimes.org on October 25, 2016. Reprinted with permission. 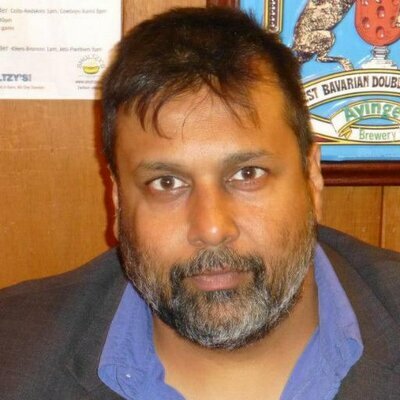 Arun Gupta is a graduate of the French Culinary Institute in New York and has written for dozens of publications including the Washington Post, the Nation, The Progressive, Telesur English, and the Guardian. He is the author of the upcoming Bacon as a Weapon of Mass Destruction: A Junk-Food-Loving Chef’s Inquiry into Taste (The New Press). Fast food workers and their allies in New York City, supported by protestors elsewhere around the country, flooded public hearings in New York today with the message that they deserve at least $15 an hour. They testified before a wage board appointed at the behest of New York Gov. Andrew Cuomo to determine standards for fast food workers in the state. The board’s work is taking place as a widening movement to raise minimum wages for the growing share of Americans in ill-paid jobs is both raising expectations and winning concrete victories. But the Fight for $15 campaign has also spurred action by many groups of low-wage workers, from home care aides to university adjunct teachers. And it is generating a complex new current within the broader labor movement that goes far beyond even their ambitious wage goals. The Los Angeles city council’s vote last month to raise the minimum wage in the nation’s second largest city to $15 an hour by 2010 was the latest—but almost certainly not the last—in a series of major local victories by low-wage workers and their advocates that started last year in SeaTac, Washington. The movement then won victories in Seattle, San Francisco and other local jurisdictions. Popular movements in other cities, such as St. Louis and Kansas City, are close to pressuring local legislators to set a minimum wage of $15 an hour. Some employers, most recently Chipotle, are apparently reading the writing on the wall and improving pay, benefits and work rules (though generally offering much less than workers want). In Los Angeles, more than 40 percent of its workforce, which has a high proportion of service workers, earn near California’s current state minimum wage of $9 an hour (or less for some tipped employees and for victims of employers’ wage theft, estimated in Los Angeles as afflicting nearly one-fifth of the low-wage workforce). They also rely heavily on public assistance programs to survive. Such aid effectively amounts to taxpayer subsidies of nearly $7 billion a year across the country to companies like McDonald’s to support the substandard wages of non-managerial fast food workers in the U.S., according to the University of California at Berkeley Center for Labor Research and Education. The contemporary movement to “raise the wage” has roots that are often run deep and wide—for example, in Los Angeles, traditional unions, worker centers and other non-union worker organizations, non-profit research and advocacy groups, faith organizations, immigrant and civil rights groups and dozens of other allies are participating in the movement. Last year, Los Angeles Mayor Eric Garcetti advocated raising the minimum to $13.25, but he missed the wave of public opinion that swept away his by then passé proposal. In a poll of Los Angeles residents, 69 percent favored a strong package of workplace improvements, including a minimum of $15.25 an hour. In Los Angeles, more than 100 groups formed the Raise the Wage coalition. Many of them had been involved in living wage battles or other campaigns to raise wages for specific groups of workers, such as hotel employees or people working at the publicly-subsidized LAX airport, or to raise awareness of how many employers cheated their employees. As a result of their work, the new law covers every worker and establishes an enforcement agency for the first time. The coalition drew on studies of the economics of raising the minimum from the Berkeley Center, the Economic Policy Institute and the non-governmental think tank the Economic Roundtable (collaborating with two UCLA research institutes) that promised little or no loss of jobs, an economic shot in the arm (especially in poor areas) and a boost in economic well-being for more than 40 percent of Angelenos. The final legislation rejected requests for exemptions from some businesses, such as the restaurant industry’s standard plea for sub-minimum wages for tipped employees, as well as a labor movement proposal that workers under collective bargaining agreements not be covered. Business critics pounced on what they claimed was labor hypocrisy and an effort to entice employers to accept unions in order to benefit from the exemption. But Kent Wong, director of the UCLA Labor Center, said, “The concern of labor is for unionized employees’ varying benefits—sick pay, pensions—with an overall package significantly higher than the minimum wage. It was an attempt to respect existing collective bargaining agreements.” The proposed revision may be taken up later, but many council members seemed unsympathetic to the union argument, even though such exemptions are common in local minimum wage laws. Even if the Fight for $15 was only one Raise the Wage member among many, the broader movement owes much to the fast food fighters. Starting with a one-day strike action two and one-half year ago by several hundred fast food workers in New York City, the organization has spread throughout the country and to other occupations, though the fast food industry is its priority. Fight for $15 has contributed to the low-wage worker movement its goals—which at first, seemed to be a far stretch—of at least $15 an hour and the right to join a union without harassment. Its grassroots dynamism and direct action tactics have inspired a variety of ill-paid workers but posed a formidable threat to its foes, most immediately McDonald’s Corporation, the world’s third largest private employer. Last weekend more than 1,300 Fight for $15 representatives gathered in Detroit for their second annual convention, and judging from their major resolution—and from the keynote speech by Mary Kay Henry, president of the Service Employees International Union, their financial and organizational backer—the organization is counting on the New York wage board determination to be good enough to become the standard for the industry. “We believe New Yorkers are leading the way to a new standard for fast-food workers and our families across the country,” the resolution reads (and Henry said that “New York is on the verge of setting a new standard that will change how we think about wages in this country”). Despite the overwhelming emphasis on higher pay, the Fight for $15 has always been a fight for a union as well. Yet increasingly leaders at all levels are focusing on the need for a union as well as for a minimum wage raise. But Kendall Fells, national organizing director of Fight for $15, acknowledges that the union cannot organize store by store, but it can keep pressure on the company as a whole until there’s an agreement about how to proceed with recognition. “The problem is the process of organizing is too small and Fight for $15 is too big,” he says, but there’s the possibility of organizing all of the stores at once, adding community pressure from clergy, allies and other unions to the pressure, including additional legal action on the company’s labor law abuse. Meanwhile, even without official recognition of their status, the workers can bring some changes by a variety of challenges at work, in the courts, and before the National Labor Relations Board. “In these workers’ minds, they already have a union because they’re sticking together and bringing change,” Fells says. Many workers are not only fighting for the $15 an hour and a union that first drew them to the campaign. They’re fighting for a better world. They see their actions as re-directing the course of history, as building a future for their children and grandchildren, and as helping workers not only in other fast food outlets but also in many other jobs and industries. They are exercising newly discovered rights as citizens of the United States and even enjoy a sense of being linked to workers in other countries. In these ways, they have already taken steps beyond developing a simple trade union mentality towards a consciousness of class that is as much ethical and political as economic. But he notes that next year is an election year, which may open possibilities. Indeed, Hillary Clinton called into the convention saying that she wanted to be the “champion” of the organization and its members. Her move may have been simply political positioning, but it at least indicates that some Democrats may feel momentarily comfortable supporting a labor struggle. At his second Fight for $15 convention, Antione Hearon, 22, was impressed by how much the movement had grown in a year, spreading across the country and even around the world. Although he hopes to be able to afford to return to community college, he wants to know that McDonald’s will pay a living wage if he has to rely on it. But he’s in it for more than himself. She talks up the union at her bus stop and when she stops by the mid-morning daily coffee club of elderly customers. That paid off when workers at her Chicago McDonald’s went out on strike. The coffee club members joined in. “I can’t put into words how that support made me feel,” she said. Fifteen dollars an hour might mean that she could take a bus to work all the time, not just half the time. More important, she might be able to visit four grandchildren she has never seen. But the experience of solidarity, of being part of a union, is a reward in itself. Even without a formal union or a pay raise, the fighting fast food workers have become winners. They’ve won a new sense of their rights and power and a new view of how they fit in the world. And that’s worth at least as much in its own way as the pay raise they need and deserve. This blog was originally posted on In These Times on June 15, 2015. Reprinted with permission. Last week, New York Gov. Andrew Cuomo (D) announced that he is taking advantage of a state law to raise minimum wages without the involvement of the legislature. He’s not the only governor with that power; others could also follow suit. New York State law gives the labor commissioner the authority to convene a wage board to investigate whether the minimum wage in a specific job — or even all of the jobs in the state — are adequate, and to issue a “wage order” to increase it without the involvement of state lawmakers. On Wednesday, Cuomo announced that he would direct the commissioner to investigate wages in the fast food industry. New York was the home to the first strike in the fast food industry demanding a $15 minimum wage and has been home to them as they continued to spread across the country. One example could be California, which has a Democratic governor, Jerry Brown, who already signed a minimum wage increase to $10 by 2016 back in 2013. “Cuomo is saying, ‘I’m going to make New York a progressive leader with the strongest minimum wage in the nation,’” Sonn said. “Jerry Brown could do the same thing.” A spokesman for the governor’s office told ThinkProgress he wasn’t aware of similar options to what Cuomo did in California, but noted that there are other new bills and proposals to raise the wage. The authority can also be used against governors who aren’t supportive of higher minimum wages. That’s already happened in Wisconsin. There, a state statute says that all wages in the state have to amount to no less than a living wage and that any member of the public can file a complaint saying the minimum wage fails that standard. Last year, low-wage workers and worker organizing groups submitted 100 complaints to Gov. Scott Walker (R) alleging that the state’s $7.25 minimum wage violates the statute, although his administration rejected the complaints. A similar fight could start brewing in New Jersey, where Gov. Chris Christie (R) has voiced his opposition to increasing the minimum wage. “The Governor of New Jersey has the power to raise wages for hundreds of thousands of workers,” Analilia Mejia, executive director of New Jersey Working Families, told ThinkProgress. “We will absolutely be calling on Gov. Christie to follow in the footsteps of Gov. Cuomo, who Christie has called his ‘separated at birth twin brother.’” She also said the issue would be brought up beyond Christie’s administration. “Over the coming year Working Families activists [will] be asking every potential gubernatorial contender in New Jersey’s 2017 election where they stand on using the state’s wage board to end poverty wages,” she said. This blog was originally posted on Think Progress on May 11, 2015. Reprinted with permission. It’s a good thing when we use real words to describe the truth. When bankers rip off people with mortgage scams, it’s robbery–even if they get away with it because we have a government unwillingness to jail them. And, once and a while, a politician gets it right. His point is that this goes way beyond one particular fine. It’s broad, it’s deep, it’s persistent.It’s a crime. Maybe he needs to school the people at the Justice Department about what a crime is. And to call it like it is. About the Author: Eric Schneiderman is a political/organizing/economic strategist. 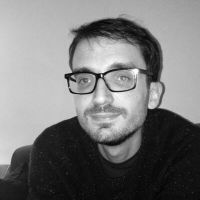 President of the Economic Future Group, a consultancy that has worked in a couple of dozen countries on five continents over the past 20 years; his goal is to find the “white spaces” that need filling, the places to make connections and create projects to enhance the great work many people do to advance a better world. He’s also publisher/editor of Working Life. Imagine you have a job where you get the full 40-hour workweek you want. You have affordable health care that meets your needs. You get five weeks paid vacation, paid maternity and paternity leave, a pension and overtime pay for working after 6 p.m. or on Sunday. You get your work schedule four weeks in advance so you can plan your life. And your employer can’t send you home early without pay because business is slow. You have a union that is well-organized and fights to make sure your rights are protected. After you pay your rent and bills, you can still put some money in your savings account, and you still have money left over to go out and have a nice evening. And you know that if times get tough, that savings you have been able to put away will help you through. Now imagine that job is a fast-food job. That’s the reality in Denmark, where fast-food employees are paid $20 an hour. And the country hasn’t fallen into anarchy, giant fast-food chains haven’t gone out of business and working families make enough money to live their lives without worrying about being one paycheck away from poverty. Now imagine a bunch of rich people on TV and radio telling you that you can’t have that Danish scenario because Denmark is “different” and “smaller,” but with no explanation as to how it is different or how being a smaller country makes it possible to pay workers more. That’s the reality in the United States where corporate interests fight against paying fast-food workers a living wage with vague excuses and warnings that never seem to pan out. They haven’t even really made the case that the fast-food companies in Denmark are less profitable. Everyone says they “assume” that Danish fast-food companies are less profitable, but no one shows the numbers. Certainly McDonald’s and Burger King know how much their locations in Denmark make in profits. Why are they so mum on the topic? “We see from Denmark that it’s possible to run a profitable fast-food business while paying workers these kinds of wages,” said John Schmitt, an economist at the Center for Economic and Policy Research. The critics are right about one thing, fast food is more expensive in Denmark. A Big Mac, for instance, costs about 80 cents more. But when the person buying the Big Mac gets paid $12 more an hour (on average), they can afford that 80 cents. And health care. And child care. And clothes for their kids.